Nicotinic stomatitis (smoker's palate), a lesion of the palatal mucosa, has been described in the literature since 1926. In 1941, Thoma named the lesion stomatitis nicotine because it is almost exclusively observed in individuals who smoke tobacco. The name is a misnomer because it is not the nicotine that causes the lesion, but the concentrated heat stream of smoke from tobacco products. [2, 3] These mucosal changes are most often observed in pipe and reverse cigarette smokers and less often in cigarette and cigar smokers. Generally, it is asymptomatic or mildly irritating. Patients typically report that they are either unaware of the lesion or have had it for many years without changes. See the image below. Classic nicotine stomatitis. Note the speckled white and red appearance from the hyperkeratosis and minor salivary gland openings. Rawal et al reported two cases of patients using marijuana with oral manifestations. They observed nicotine stomatitis–like lesions in addition to gingival hyperplasia and uvulitis. The heat from smoking marijuana causing minor salivary gland inflammation theoretically should produce similar lesions as tobacco smoking. Nicotine stomatitis affects the oral mucosa of the hard palate posterior to the rugae and the adjacent soft palate. [5, 6] . Lesions are not seen on the anterior hard palate since there are no minor salivary glands present where the rugae are present. The red orifices of the lesions are inflamed salivary gland ducts, as shown in the image below. Inflamed salivary gland ducts in nicotine stomatitis. Nicotine stomatitis has been associated with pipe, cigarette, and cigar smoking, and, rarely, with chronic ingestion of high-temperature liquids or other irritants. The mechanism of action is heat and chemical irritation from a tobacco product that acts as a local irritant, stimulating a reactive process, including inflammation, hyperplasia, and epithelial keratinization. Dentures often protect the palate from these irritants in patients who wear them. The appearance of nicotine stomatitis is related directly to the population that smokes tobacco products. Men and women who smoke tobacco products are affected equally by nicotinic stomatitis. Women smoke pipes less often than men; therefore, nicotinic stomatitis is less prevalent in women. Educate patients with nicotinic stomatitis concerning the dangers of tobacco use. Many cigar and pipe smokers believe that they are not at risk for cancer because they do not inhale. Thoma KH. Stomatitis nicotine and its effect on the palate. Am J Orthod. 1941. 27:38-47. Rossie KM, Guggenheimer J. Thermally induced 'nicotine' stomatitis. A case report. Oral Surg Oral Med Oral Pathol. 1990 Nov. 70(5):597-9. [Medline]. dos Santos RB, Katz J. Nicotinic stomatitis: positive correlation with heat in maté tea drinks and smoking. Quintessence Int. 2009 Jul-Aug. 40(7):537-40. [Medline]. Rawal SY, Tatakis DN, Tipton DA. Periodontal and oral manifestations of marijuana use. J Tenn Dent Assoc. 2012 Fall-Winter. 92 (2):26-31; quiz 31-2. [Medline]. Vellappally S, Fiala Z, Smejkalova J, Jacob V, Somanathan R. Smoking related systemic and oral diseases. Acta Medica (Hradec Kralove). 2007. 50(3):161-6. [Medline]. Samatha Y, Sankar AJ, Ganapathy KS, Srinivas K, Ankineedu D, Choudary AL. Clinicopathologic evaluation of lesions associated with tobacco usage. J Contemp Dent Pract. 2014 Jul 1. 15 (4):466-72. [Medline]. Centers for Disease Control and Prevention. Current Cigarette Smoking Among Adults in the United States. Available at https://www.cdc.gov/tobacco/data_statistics/fact_sheets/adult_data/cig_smoking/index.htm#national. March 14, 2016; Accessed: September 23, 2016. Mathew AL, Pai KM, Sholapurkar AA, Vengal M. The prevalence of oral mucosal lesions in patients visiting a dental school in Southern India. Indian J Dent Res. 2008 Apr-Jun. 19(2):99-103. [Medline]. Pentenero M, Broccoletti R, Carbone M, Conrotto D, Gandolfo S. The prevalence of oral mucosal lesions in adults from the Turin area. Oral Dis. 2008 May. 14(4):356-66. [Medline]. Gu D, Kelly TN, Wu X, et al. Mortality attributable to smoking in China. N Engl J Med. 2009 Jan 8. 360(2):150-9. [Medline]. Hoeijmakers JH. DNA damage, aging, and cancer. N Engl J Med. 2009 Oct 8. 361(15):1475-85. [Medline]. Regezi J, Sciubba J, Jordan R, eds. White Lesions. Oral Pathology. 4th ed. St. Louis, Mo: WB Saunders; 2003. 81-2. Neville BW, Damm DD, Allen CM, Chi AC. Epithelial Pathology. Oral and Maxillofacial Pathology. 4th ed. Philadelphia, Pa: Saunders; 2016. 331-421. Silverman S Jr, ed. Oral Cancer. 5th ed. Hamilton, Canada: BC Decker; 2003. 1-16. Regezi JA, Sciubba JJ, Jordan RCK. White Lesions. Oral Pathology: Clinical Pathologic Correlations. 7th ed. St. Louis, Mo: Elsevier, Inc.; 2017. 86-7. 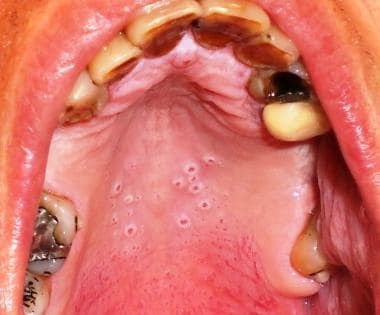 Jones KB, Jordan R. White lesions in the oral cavity: clinical presentation, diagnosis, and treatment. Semin Cutan Med Surg. 2015 Dec. 34 (4):161-70. [Medline]. Myung SK, McDonnell DD, Kazinets G, Seo HG, Moskowitz JM. Effects of Web- and computer-based smoking cessation programs: meta-analysis of randomized controlled trials. Arch Intern Med. 2009 May 25. 169(10):929-37. [Medline]. [Guideline] US Public Health Service. Treating tobacco use and dependence: 2008 update U.S. Public Health Service Clinical Practice Guideline executive summary. Respir Care. 2008 Sep. 53(9):1217-22. [Medline]. Mohammed F, Fairozekhan AT. Leukoplakia, Oral. 2018 Jan. [Medline]. [Full Text]. American Dental Association. Appendix. Ciancio S. Dental Therapeutics. 5th ed. Chicago, Ill: American Dental Association; 2009. 1115-1120. Reid RD, Pritchard G, Walker K, Aitken D, Mullen KA, Pipe AL. Managing smoking cessation. CMAJ. 2016 Dec 6. 188 (17-18):E484-E492. [Medline]. [Full Text]. Hays JT, Ebbert JO. Varenicline for tobacco dependence. N Engl J Med. 2008 Nov 6. 359(19):2018-24. [Medline]. Prochaska JJ, Benowitz NL. The Past, Present, and Future of Nicotine Addiction Therapy. Annu Rev Med. 2016. 67:467-86. [Medline]. [Full Text]. Fissured appearance of nicotine stomatitis. Notice the gingival-palatal areas where a partial denture protects the mucosa from the heat and smoke. Nicotine stomatitis in a reverse smoker. Notice the increased hyperkeratosis, hyperplasia, and swelling of minor salivary glands.